The tractor-trailer driver, who was killed Wednesday when he crashed into several vehicles in a work zone on the Woodrow Wilson Bridge, had been involved in a triple-fatality work zone crash 25 years earlier. 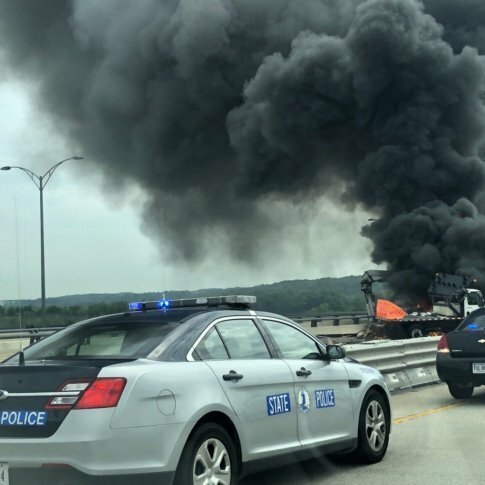 WASHINGTON — The driver of a tractor-trailer, who was killed Wednesday when he crashed into several vehicles in a work zone on the Woodrow Wilson Bridge, had been involved in a triple-fatality work zone crash 25 years earlier. Rodell Jones, 60, of Bordentown, New Jersey, died when his tractor, towing an empty 53-foot trailer, crashed into a crash-attenuator truck and then a bucket truck in a work zone on the Outer Loop lanes of the Wilson Bridge on June 20. Three workers, who were in a bucket underneath the bridge, were left stranded and had to be rescued by boat by members of the Prince George’s County Police Department. Online court records and news searches show Jones was arrested and charged in connection with the deaths of three workers, who were killed in a work zone on the New Jersey Turnpike on Sept. 25, 1992. According to The New York Times, a New Jersey truck driver by the name of Rodell Jones, who was 35 years old at the time, was charged with three counts of death by auto and two counts of aggravated assault in the crash on the Newark Bay extension of the turnpike in Bayonne. Almost two years later, according to the West Essex Tribune, Jones was acquitted in the case. According to the news report, a New Jersey state trooper had been protecting the work zone, but left to pursue a speeding vehicle shortly before Jones went over a protective barrier into the work zone. The Hudson County, New Jersey, prosecutor had said Jones suffered an epileptic seizure behind the wheel, which caused him to lose control of the panel truck he was driving. Court records show Jones and the company he was working for, Colonial Foods Inc., were sued by the victims’ families. Charles Waller, 60, Michael Carbone, 41, and Antonio Mateiro, whose age was not available, were killed in the crash. Requests for comment from Jones’ employer at the time he was killed, JB Hunt Transport, were not immediately returned. WTOP’s Valerie Bonk and Jack Moore contributed to this report.